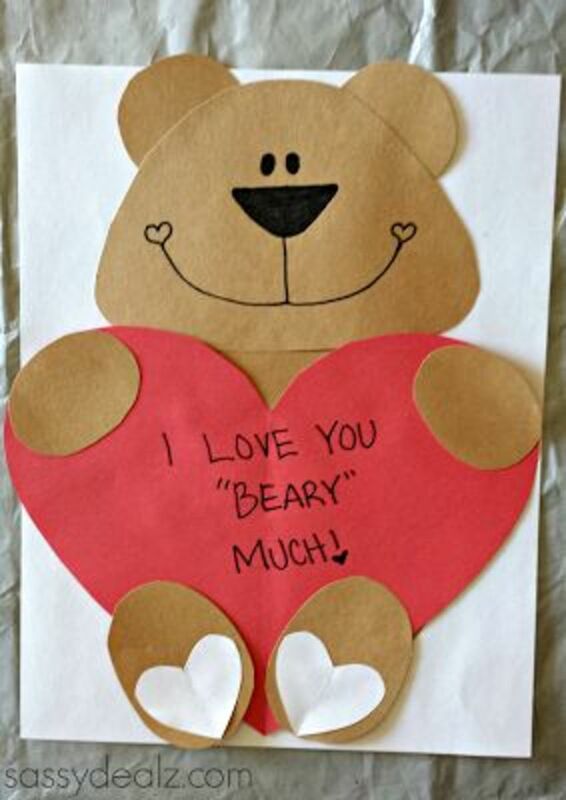 Valentine's Day is the best time for craft with the kids. They will love to make the neat heart shaped animals featured here. You won't need much skill to make them. 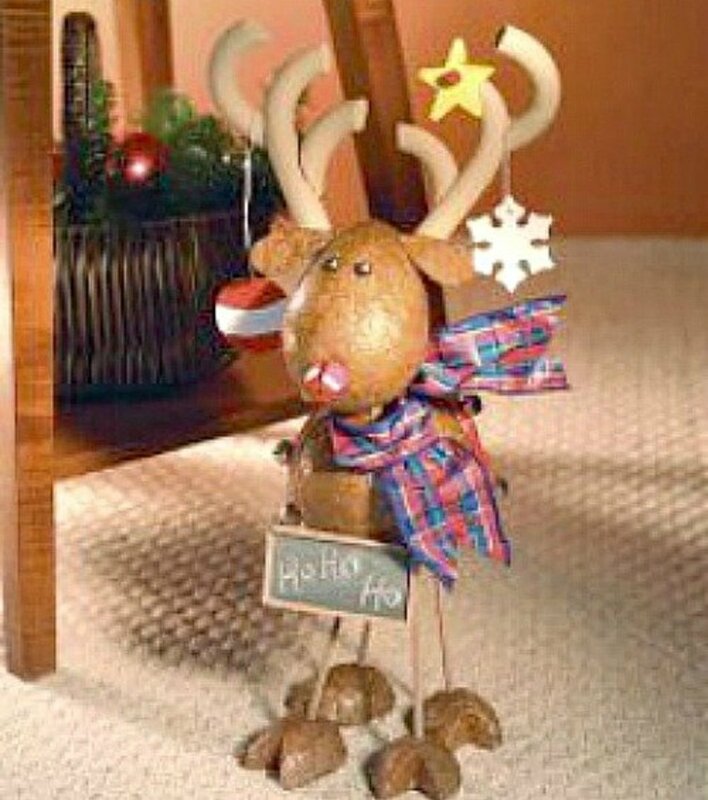 Take a look at them and decide which of them you would like to make with the little ones or have a kiddy party and make a few each! 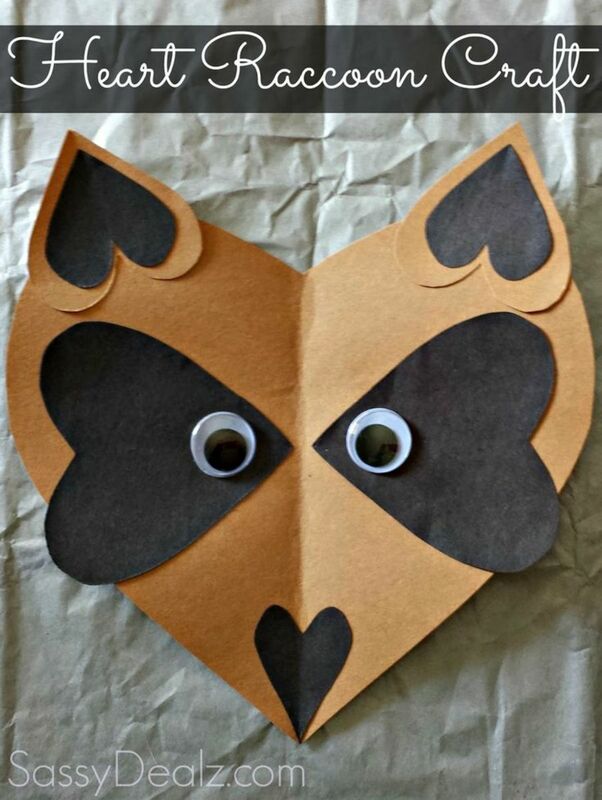 To make this you need, black/white construction paper, two googly eyes, scissors, a black marker, and glue. Cut out a big white heart with a rounded bottowm. 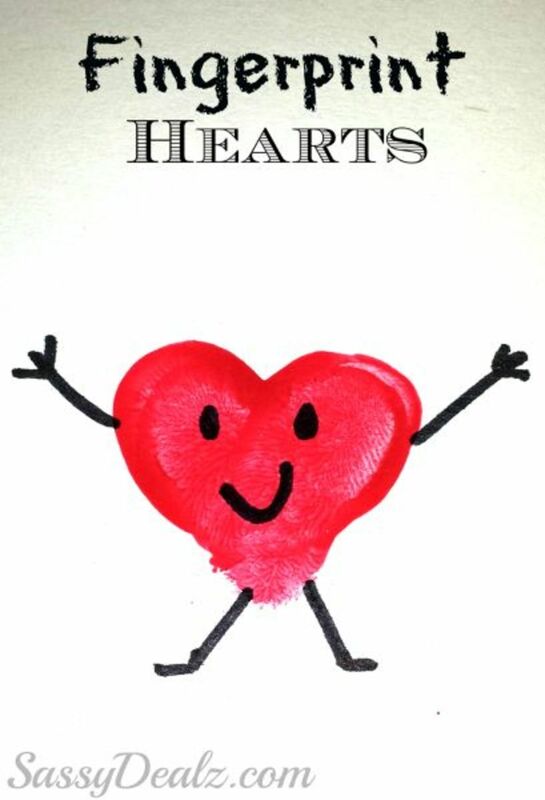 Two black hearts make up the ears , and add goggly eyes. Cut out small hearts to make this cutie. Overlap them to form the body. Use a black sharpie to make legs and smile. Cut out three red hearts (two big, one small) and a big pink heart. Add googly eyes and a black sharpie makes the whiskers. Get two green sheets of construction paper, scissors, glue, and a little bit of white and red paper. You can use a template to draw the frog or just draw it free hand. 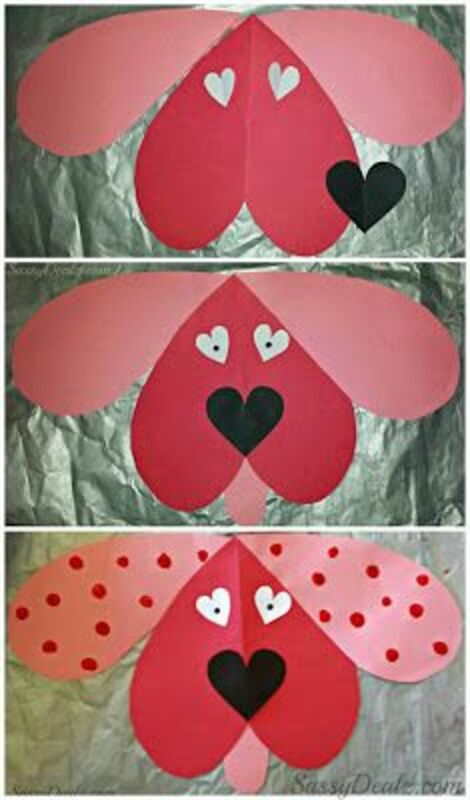 Cut out two big red and pink hearts from construction paper. Halve the pink heart to make the ears. 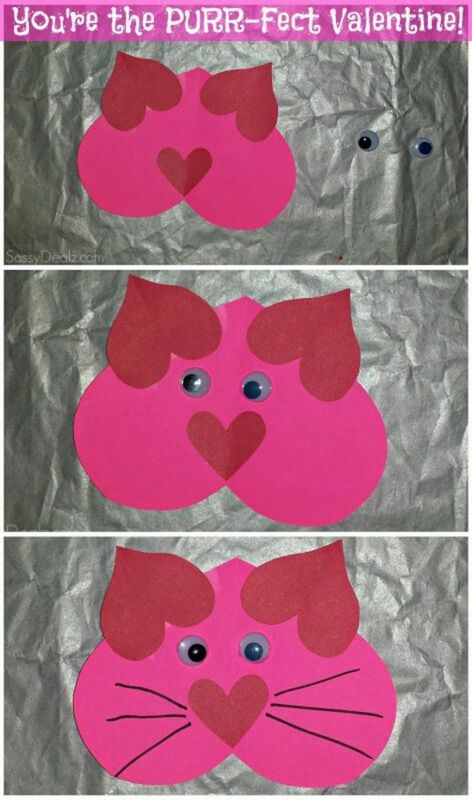 Use heart shapes to form the eyes and the nose also. Supplies needed include: orange/black/white paper, scissors, glue, and big googly eyes. The sharp heart shape is perfect for the fox face. This tiger is so like Garfield and makes a cute little valentines to give to grandparents. Upcycling cardboard tubes for heart stamps is the best idea. A piece of tape is wrapped around the whole tube. Use red paint for the 'ink'. Cut out a big orange heart and a smaller yellow one for the inside. Fringe the outer heart to look like fur. 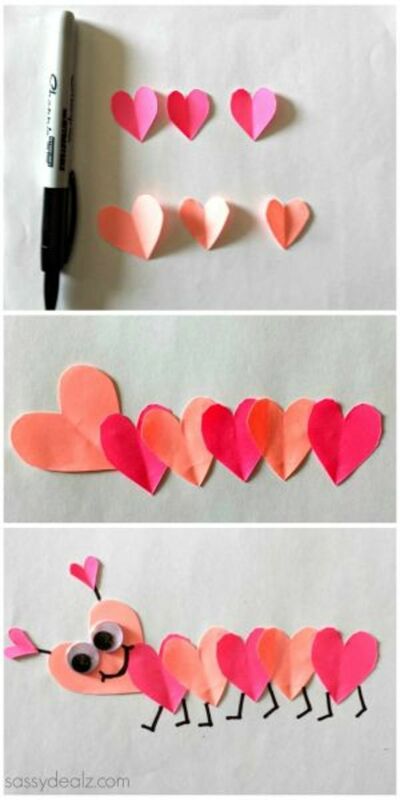 Draw a big heart on a white sheet of paper.Use different colored post its to 'color' it in. 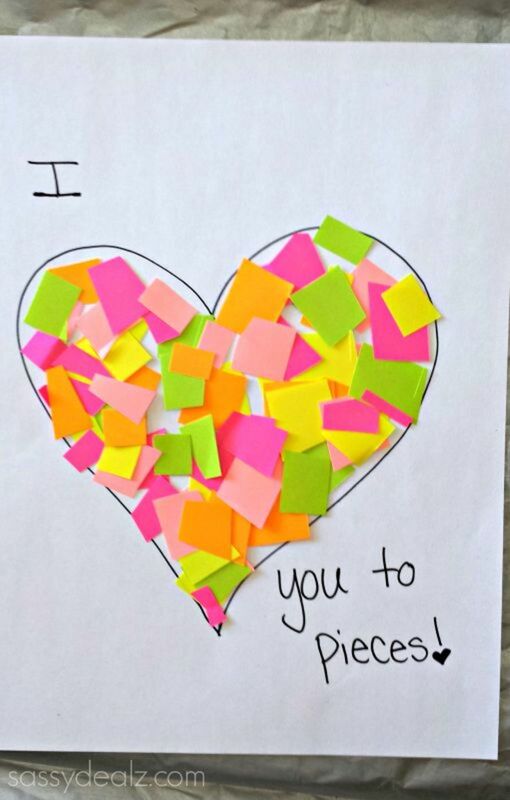 Write “I Love You to Pieces”. 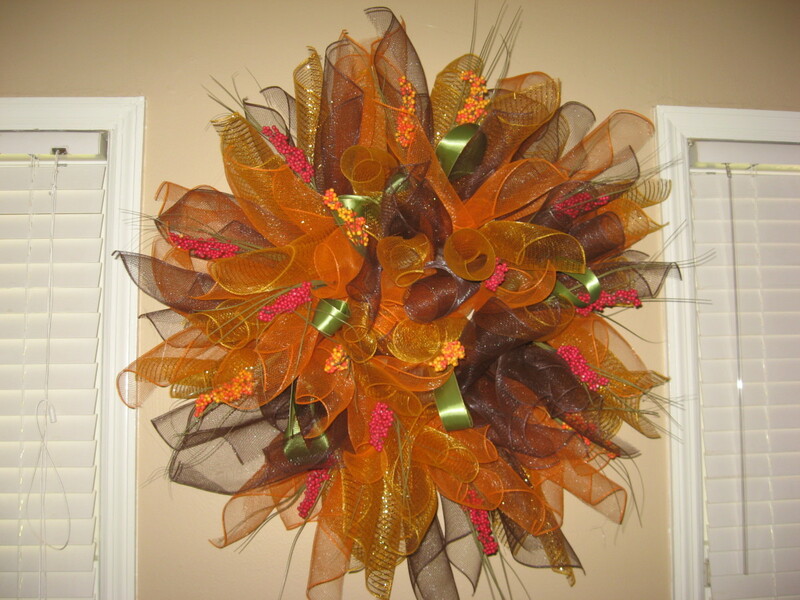 You need orange/yellow/white construction paper, glue, scissors, and a black marker. Form the chick's body out of the yellow hearts and the legs and beak from the orange. 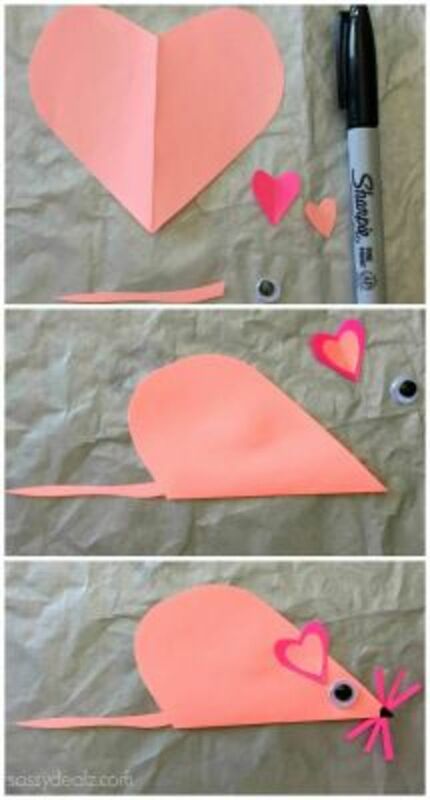 Fold a pink paper heart in half and use small hearts for ears to make this little mouse. 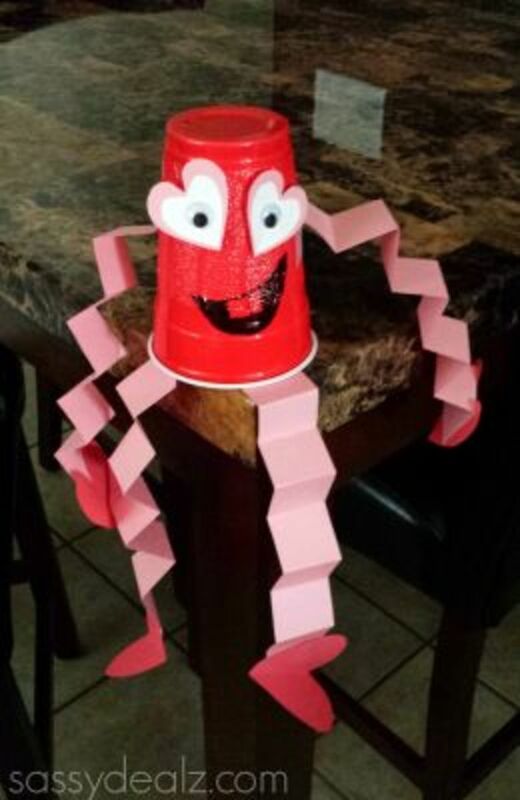 This little guy is the perfect way to recycle your cups. Just add eyes and some paper trim for legs and arms. Use two shades of pink for this little piggy. Cut a big pink heart that is rounded on the bottom and top. 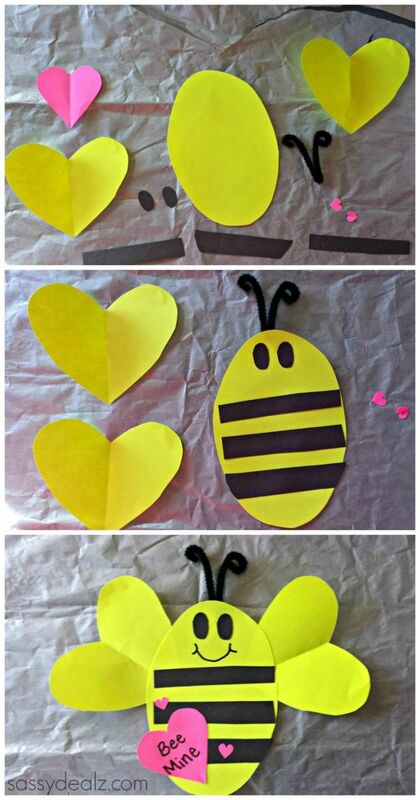 2 same sized yellow hearts make the wings of this bee. Why not build a whole bee mine themed party around this. This bear is definitely one to treasure forever, don't you just love the white hearts on his feet?! You could make this little guy out of grey and pink paper if you prefer a more authentic look. Two little thumb prints for this adorable heart. Laminate it and make as gifts for relatives a record of your child's thumb print for memory books. If you have a few naughty little monkeys then they will love to make this guy. 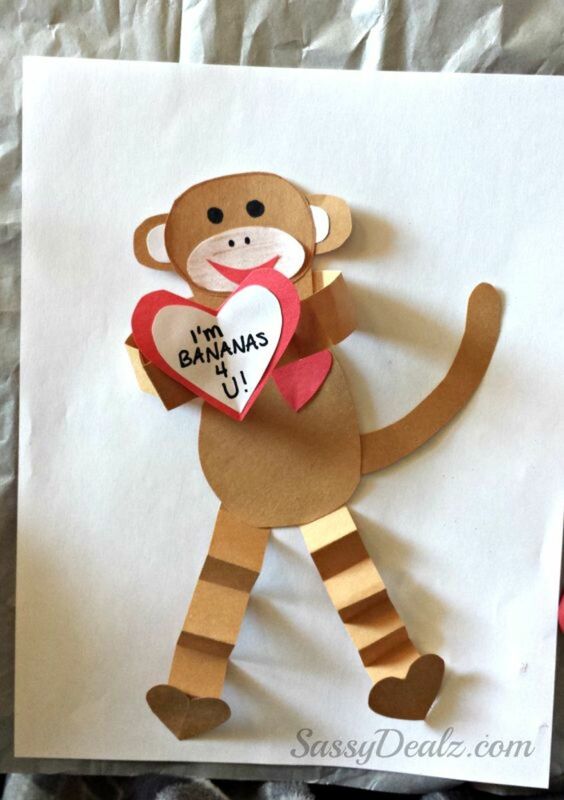 Get plenty of brown construction paper and let them write their names on their own monkeys. This raccoon is made very similarly to the panda and the fox. 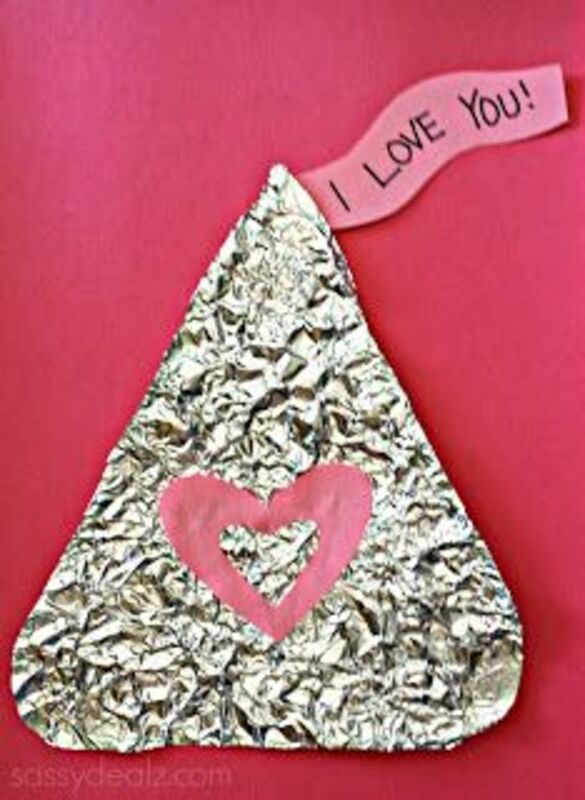 Crumpled tin foil formed into the shape of a Hershey's kiss is the idea of this craft. You can make it as big or as small as you like. 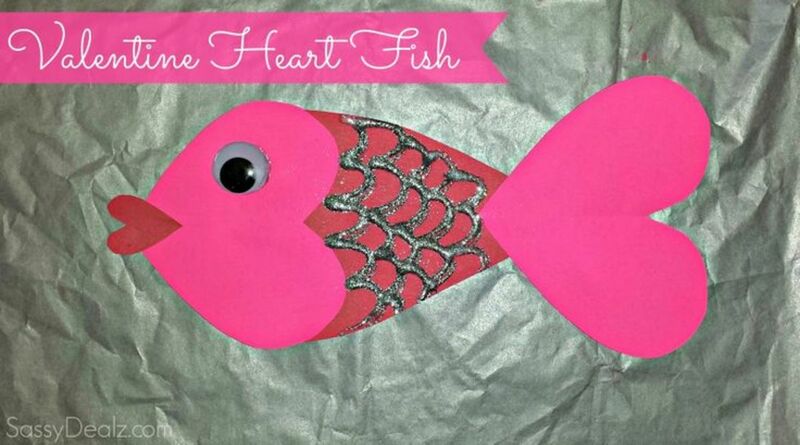 Two pink hearts about the same size, and a small skinny heart make this fishy wonder. Get some nice silver paint to draw in the scales. This is by far my most favorite of all the paper animals featured. Who can resist an adorable penguin formed from hearts ?! 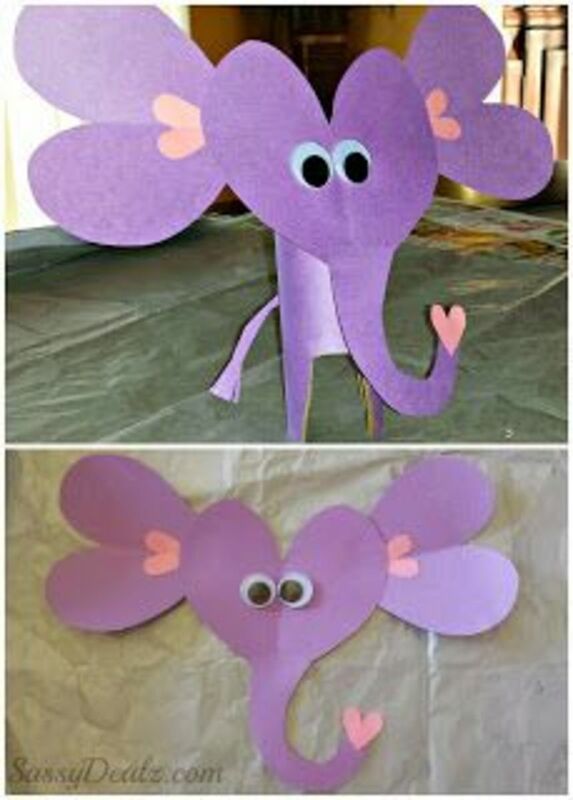 Construction Paper Crafts for Kids - Learning Opportunities Included! I was searching for a fun Valentine's day project to do with the Ice Princess to pass out for her first grade class, these are perfect! She just learned how to cut out hearts so she will have a lot of fun!!! wow great selection of crafting ideas for Valentines Day. I am going to show your pictures to my 3 yr old and see if her wants to make something. That is if he will sit for 10 minutes LOL. Tweeting, Google+ ing Pinning and sharing. 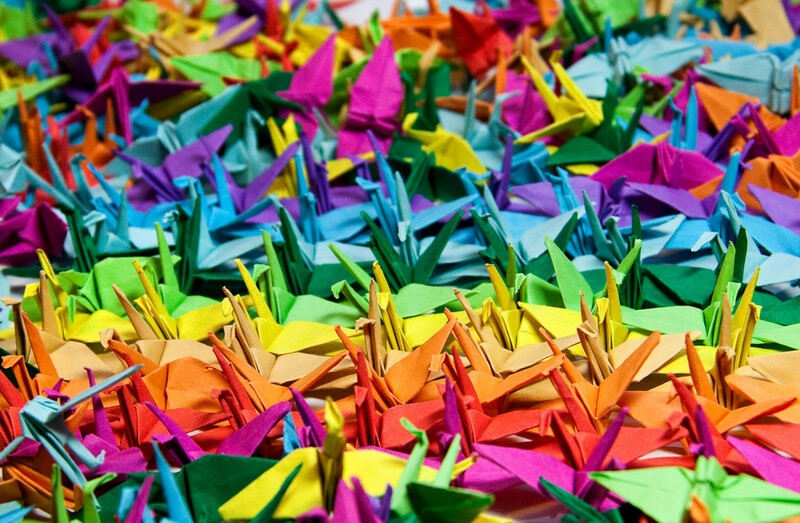 These crafts are so adorable! Perfect for both children and adults! Sweet activities for a sweet holiday. 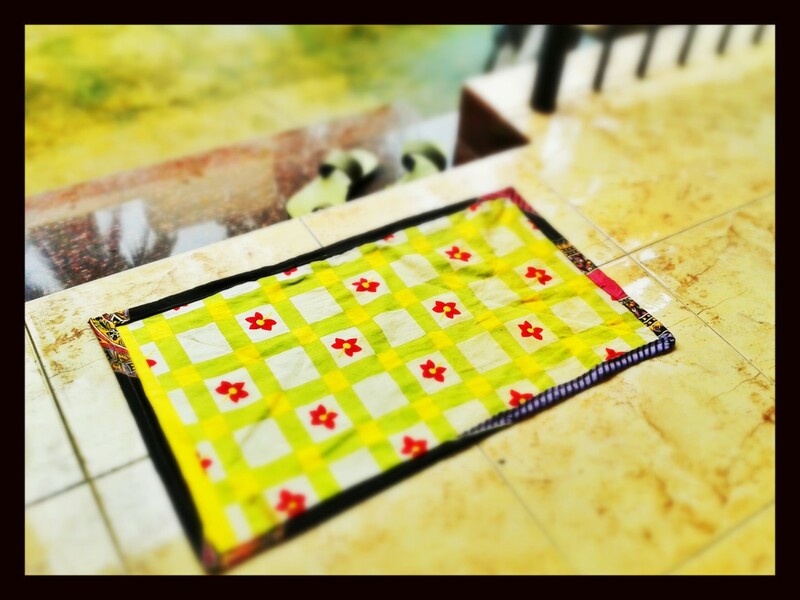 Kids love crafting which makes it an effective tool for learning. I will be sharing some of my activities for the Love Holiday in a few days (I hope). 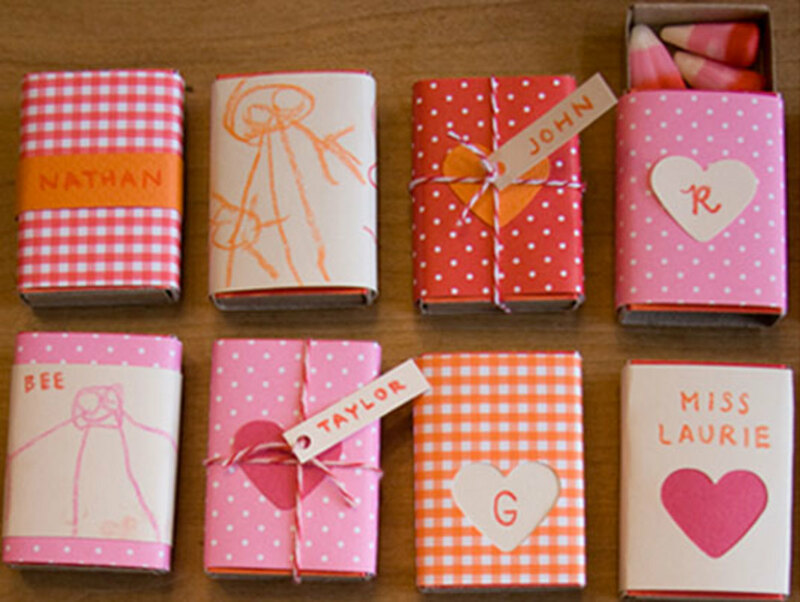 Such cute crafts for both boys and girls to do as Valentine's Day activities. There is a lot of room for them to express their creativity by personalizing the projects in this list. These are adorable. Passing this along to the little ones in my extended family, hoping I'll get some homemade crafts back for Valentine's Day. I miss all the kid art. Thanks for visiting DDE hope you have a lovely Valentines ! Awesome ideas. I like the creative mind you have and a special day indeed with such simple thought sounds perfect.